Flyball races match two teams of four dogs each, racing side-by-side over a 51 foot long course. 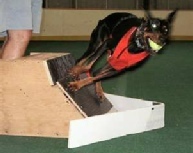 Each dog must run in relay fashion down the jumps, trigger a flyball box, releasing the ball, retrieve the ball, and return over the jumps. The next dog is released to run the course but can't cross the start/finish line until the previous dog has returned over all 4 jumps and reached the start/finish line. The first team to have all 4 dogs finish the course without error wins the heat. The NAFA World Record is now 15.22. Class size is limited to 10 participants. Minimum of 5 to start the class.